El mecanismo de la aplicación es muy sencillo, simplemente elige un icono y obté códigos relacionados. 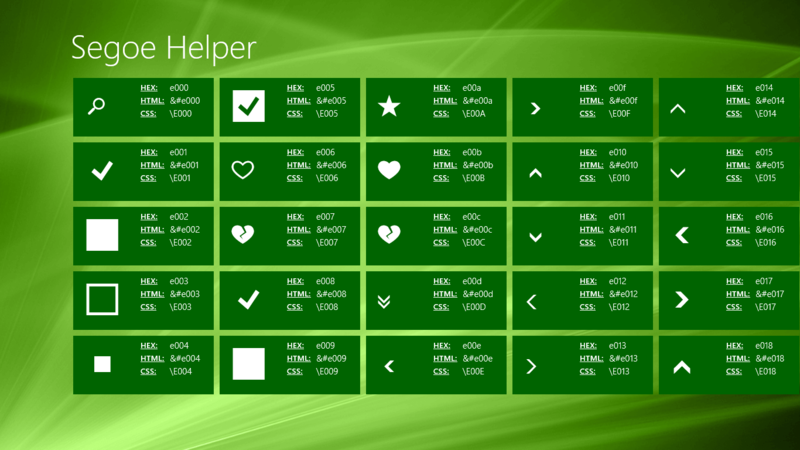 This is an application for Windows 8 applications developers, made in HTML, CSS and Javacript. Although it can also be useful for developments in XAML, C, Python or in any other programming language. Say goodbye to the problems and complications at the moment of looking for icons for your applications. Segoe UI Symbol font is the predetermined one for icons on Windows 8 applications. As being these icónos a font, are vectorial images, as far as size problems doesn’t exist, they will always be seen correctly. It can be useful both for programmers and for designers. You will be able to get code to copy , paste into your applications. Icons for Windows 8 with Segoe UI Symbol font family. Exports the icons code with font to any size without losing quality. The mechanism of the application is very simple, just choose an icon and obtained related codes. To use you must have internet connection. Agrees to comply with applicable regulations on the proper use and handling of personal data and e-commerce legislation . The application does not require any registration , which allows to use the application without identifying themselves. This application or solicit personal information , or data stored on your device.